Faculty members of the Humber School for Writers discuss the craft of writing fiction. Find out how these acclaimed authors approach story and novel writing from start to finish. Kevin Barry’s debut story collection, There Are Little Kingdoms, was a recipient of the Rooney Prize for Irish Literature. His first novel, City of Bohane, won the 2013 International IMPAC Dublin Literary Award and was shortlisted for the Costa First Novel Award. Barry presents his most recent story collection, Dark Lies the Island, which won the Sunday Times Short Story Prize and was nominated for the Edge Hill Short Story Prize. These unpredictable tales of love, cruelty, crime, desperation and hope have firmly established Barry as one of the most exciting voices of his generation. Wayson Choy’s bestselling debut novel, The Jade Peony, shared the Trillium Book Award for best book in 1995 and won the 1996 City of Vancouver Book Award. Its companion novel, All That Matters, also won a Trillium Book Award and was shortlisted for the 2005 Giller Prize. His first memoir, Paper Shadows, was a finalist for the Governor General’s Literary Award for Non-Fiction, the Charles Taylor Prize and the Drainie-Taylor Biography Prize. Choy presents his second memoir, Not Yet, about the bonds of love and family that sustain us, framed by Choy’s own two near-death experiences. Karen Connelly is the author of 10 books of bestselling non-fiction, fiction and poetry. She has won the Pat Lowther Memorial Award for her poetry, the Governor General’s Award for her non-fiction and Britain’s Orange Broadband Prize for New Fiction for her first novel, The Lizard Cage. Connelly presents her latest collection of poetry, Come Cold River, a searing portrayal of her troubled family. Refracted through different Canadian cities and foreign landscapes, the book expands into an authentic homage to those who are made invisible and silenced. 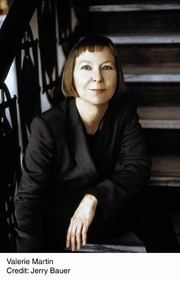 Valerie Martin is the author of nine novels, including Trespass, Italian Fever, The Great Divorce, Mary Reilly and the 2003 Orange Prize for Fiction winner, Property. She has also published three collections of short fiction. Martin presents The Ghost of Mary Celeste, a captivating, atmospheric piece of historical fiction. In 1872, the American merchant vessel Mary Celeste was discovered adrift off the coast of Spain: her cargo was intact and there was no sign of struggle, but the crew was gone. They were never found. This maritime mystery lies at the centre of an intricate narrative branching through the highest levels of late 19th-century literary society. Nino Ricci’s first novel, Lives of the Saints, garnered international acclaim and won a host of awards, including the Governor General's Literary Award for Fiction and the Books in Canada First Novel Award. His work has been shortlisted for the Scotiabank Giller Prize and the Rogers Writers’ Trust Fiction Prize, and in 2006, Ricci was named the inaugural winner of the Alistair MacLeod Award for Literary Achievement. Ricci presents The Origin of Species, the story of an unexceptional man who is haunted by an extraordinary experience in the Galapagos Islands, the consequences of which threaten to upend the precarious balance of his ordinary life. Antanas Sileika is the author of three novels and one collection of linked short stories, Buying on Time, which was nominated for both the City of Toronto Book Award and the Stephen Leacock Award for Humour. His last novel, Underground, was a Globe and Mail Best Book selection. He lives in Toronto, where he is the director of the Humber School for Writers. Valerie Martin's book New Orleans Noir: The Classics was available from LibraryThing Early Reviewers. Valerie Martin is currently considered a "single author." If one or more works are by a distinct, homonymous authors, go ahead and split the author. Valerie Martin is composed of 2 names. You can examine and separate out names.